The trial for the man accused of gunning down a Broadway Market QFC wine steward in 2012 is slated to begin next month, according to court documents. The trial for Thomasdinh Bowman in the murder of Yancy Noll is now scheduled to start September 22nd after it was initially slated to begin in February. According to court documents, prosecutors expect the proceedings to last three to four weeks. In September 2012, Bowman was charged with first-degree murder for allegedly shooting Noll in the head outside Noll’s at 15th Ave NE and 75th home. King County prosecutors have called it a “thrill kill” case. If convicted, prosecutors say Bowman, a former child prodigy and onetime resident of the E Republican Melrose Terrace co-op building, will face up to 31 years in prison. Bowman’s defense attorney John Henry Browne entered a plea of not guilty on charges Bowman gunned down Noll in his vehicle just blocks from each of their homes. According to charging documents, Bowman pulled his car next to Noll’s at 15th Ave NE and 75th and shot Noll in the head. The two men are believed to have never met prior to the shooting. Also scheduled for trial in September is the Capitol Hill man arrested in 2012 for allegedly running a sophisticated operation to sell stolen goods from his 12th and Mercer home. Prosecutors say Rabindranath Darling was buying items he knew to be stolen and selling them on eBay. Darling, who pleaded not guilty in the case, is scheduled to appear in court September 2nd. 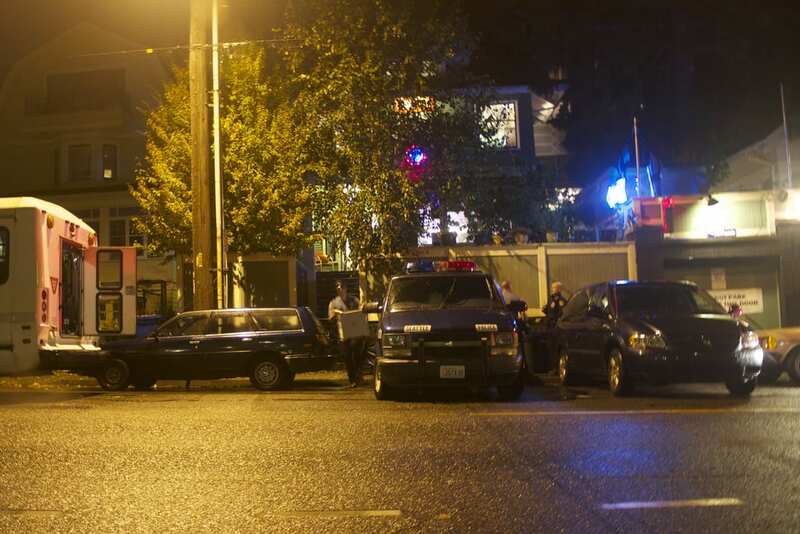 When police raided the 12th Ave house in November 2012, they needed a trailer to haul off all the evidence. Computers, tools, and bikes with an estimated worth of “well in excess of $100,000″ were allegedly found throughout the Capitol Hill property. Police reported finding a shed filled with professional grade musical mixing equipment, scuba gear, Tiffany brand jewelry, and “a large amount of one brand of makeup.” Boxes in the basement contained Rolex watches and expensive data storage equipment. Many items would later be traced to past burglaries around Capitol Hill and Seattle. This entry was posted in Crime, News, etc. by Bryan Cohen. Bookmark the permalink. The only reason the Yancy Noll murder trial keeps getting pushed is the defense’s desperate attempt to find a way to defend that murderer. Eventually the trial will have to happen and justice, hopefully, will be served. Same thing about the Darling case. It will have been two years since his arrest when the trial commences. Whatever happened to “swift justice”? Answer…defense lawyers. It’s a good thing a person’s guilt or innocence isn’t determined by yahoos on comment boards who have magical access to all the facts and evidence. Hang ’em High!! Where do you see that anyone here has proclaimed guilt? Both of the above comments simply make the point that a trial is sometimes long-delayed by clever defense lawyers. I asked a friend who is a lawyer why a trial would continually be postponed – that it seemed counter to “a speedy trial” and she told me it was the defense delaying the trial…and the only reason for the defense to delay the trial is they have yet to come up with a reasonable defense. I’d love to hear Robert’s reasoning as to why Yancy Noll was murdered by gun at a stop light by a stranger and what sort of explanation that would be reasonable. Unless the SPD caught the accused red-handed…that is, the murderer shot the victim right in the line of sight of the police…well, a trial has to be held to determine who committed the crime. You would expect the same if YOU were accused of a crime, correct? Now, a judge has to determine if he or she will grant a defense lawyer’s delay request. Since you and I don’t have magical access to all the facts of the case, we can only presume the judge has a good reason to grant the lawyer’s delay request. My point is that in the end, it’s the judge who’s in charge of trial’s proceedings. Would you have it another way? And yes, I’m aware there’s a pile of circumstantial evidence that would incriminate the suspect Dinh Bowman. However, the key word is “circumstantial.” A trial has to be held to see if Mr. Bowman is indeed the murderer. And making full circle, the judge has determined that a delay is needed so that the SUSPECT can get a fair trial. I’m not naive as to think our justice system is perfect. But I still believe our flawed system is infinitely better than mob justice and lynchings. Because mob justice is the tone I’m picking up here. Since I don’t have a time machine that can transport me to the scene of the crime, I have to presume Mr. Bowman is innocent until deemed otherwise. Because of crap defense lawyers, racism, etc etc, too many innocent people end up in prison or even death row. I take murder trials very seriously, for both the victims and the accused, so I choose to respect the judge’s decision to delay the trial. Robert, I think you should look up the evidence – specifically, the police report itself. Yes, we need to follow through with our justice system, however, with the evidence there is, it would be inconceivable for him to not be found guilty. It is pretty cut-and-dry. If convicted…why would Bowman only get 31 years for shooting a man dead at a stop light? Our Governor has said he won’t be enforcing executions, so even if he got the dealth penalty, it probably won’t happen. Regarding why ‘only’ 31 years, it probably has to do with how premeditated it was in advance, whether there were additional aggravating circumstances, etc. Probably the top of the sentencing range w/o additional factors involved. Anyone have any updates on the Bowman trial? News on it just dried up. Any news on the Darling fencing operation? He seems to be living his normal collection life.